Image shows high magnification bright field transmission electron microscopy (TEM) image showing obvious delineation of alumina film and surface of particle. In this work, performed by NRL researchers, the growth per cycle (GPC) during atomic layer deposition is compared for different batches of powder with average particle sizes ranging from nanometer (nm) to micrometer (μm). Samples prepared after depositing thin alumina films (from 10 to15 nm) on tungsten powders using particle atomic layer deposition (p-ALD) were investigated with x-ray photoelectron spectroscopy (XPS), scanning and transmission electron microscopy (SEM), and TEM. Scientists at the U.S. Naval Research Laboratory (NRL) have devised a clever combination of materials -- when used during the thin-film growth process -- to reveal that particle atomic layer deposition, or p-ALD, deposits a uniform nanometer-thick shell on core particles regardless of core size, a discovery having significant impacts for many applications since most large scale powder production techniques form powder batches that are made up of a range of particles sizes. "Particle atomic layer deposition is highlighted as a technology that can create new and exciting designer core/shell particles to be used as building blocks for the next generation of complex multifunctional nanocomposites," said Dr. Boris Feygelson, research engineer, NRL Electronics Science and Technology Division. "Our work is important because shell-thickness is most often a crucial parameter in applications where core-shell materials can be used to enhance performance of future materials." Atomic layer deposition is a layer-by-layer chemical vapor deposition-based thin-film growth technique used extensively in the electronics industry to deposit nanometer-thick films of dielectric materials on devices. Combined with other deposition and shadowing masking techniques, ALD is an integral part of electronic chip and device manufacturing. The same gas-phase process can be applied in a rotary or fluidizing powder bed reactor to grow nanometer-thick films that are highly conformal and uniformly thick on individual particles. Previous research on p-ALD, patented by ALD NanoSolutions, Inc., has shown that growth of each layer during the deposition process varies with particle size, with the underlying assumption that larger particles will always have less growth. To observe this growth phenomenon, the NRL team grew alumina on nano- and micron-sized particles of tungsten and measured the shell thickness in a transmission electron microscope. Because of the huge mass/density difference of the two materials, this pairing provides maximum contrast in the electron microscope and delineation was easily distinguishable between the particle core and shell. In their research, the scientists created core and shell powders consisting of a tungsten particle core and thin alumina shell that were then synthesized using atomic layer deposition in a rotary reactor. Standard atomic layer deposition of trimethylaluminum and water was performed on varying batches of powder with different average particle sizes. "Amazingly, we found that the growth per cycle of the alumina film on an individual particle in a batch was shown to be independent of the size of an individual particle, and therefore, a powder batch -- which consists of particles sizes spanning orders of magnitude -- has constant shell thicknesses on all particles. This result upsets the current understanding of ALD on particles," said Dr. Kedar Manandhar, ASEE postdoc, NRL Electronics Science and Technology Division and leading author of the research paper. The work, published recently in the Journal of Vacuum Science and Technology A, suggests that water, a reactant in the ALD process, is reason for the same rate of growth on different particles. This uniformity of thickness on different particle sizes in a particular batch is determined to be due to the difficulty of removing residual water molecules from the powder during the purging cycle of the atomic layer deposition (ALD) process. "Water is very sticky and it is very difficult to remove the last mono-layer from surfaces," Feygelson says. "And when you have a tumbling bed of powders, the water sticks around between the particles and results in consistent shell growth in the tumbling powder. 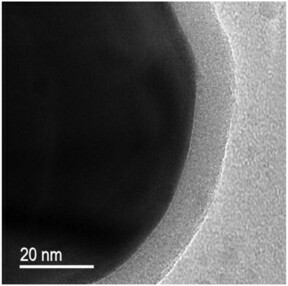 Applications for this research demonstrate implications for use in materials like abrasion resistant paints, high surface area catalyst, electron tunneling barriers, ultra-violet adsorption or capture in sunscreens or solar cells and even beyond when core-shell nanoparticles are used as buildings blocks for making new artificial nanostructured solids with unprecedented properties. This research is a cross-disciplinary effort at NRL between the Materials Science and Technology Division and Electronics Science and Technology Division. The authors of the paper gratefully acknowledge Drs. Dev Palmer (Defense Advanced Research Projects Agency), Baruch Levush (NRL), and Fritz Kub (NRL). If you have a comment, please Contact us. Issuers of news releases, not 7th Wave, Inc. or Nanotechnology Now, are solely responsible for the accuracy of the content.